Full name is Xander Jan Bogaerts. Signed by Mike Lord (Red Sox). Speaks English, Spanish, Dutch, and Papiamento. Was knighted in 2011 by the governor of Aruba after helping Netherlands win a gold medal in the IBAF Baseball World Cup. Participated in the Senior Little League World Series in Bangor, ME in 2009. Graduated from Colegio Arubano High School in Aruba in 2009. 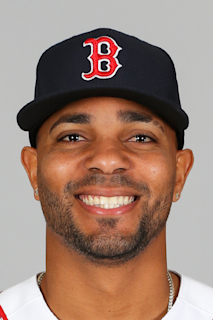 Is the twin brother of former Red Sox minor league 1B Jair Bogaerts, who was a player to be named later sent to the Cubs on 3/29/12 to complete the compensation for Theo Epstein joining the Cubs as the team's President of Baseball Operations. 2018: Finished 13th in the BBWAA's AL MVP voting... In 136 games, hit .288 (148-for-513) and set career highs in HR (23), RBI (103), doubles (45), XBH (71), OBP (.360), SLG (.522), and OPS (.883). Ranked among AL leaders in RBI (T-5th), doubles (5th), XBH (11th), AVG (16th), OBP (15th), SLG (8th), and OPS (6th). 71 of his 148 hits (48.0%) went for extra bases...35 of his XBH came with 2 strikes, tied for 2nd-most in the majors (Betts-38, Arenado-35). Was 1 of 16 players to record 100+ RBI in 2018, ranking 5th in MLB in AB/RBI ratio (4.98)...Was 1 of only 4 players in that group to also have 40+ doubles. Became only the 2nd Red Sox shortstop to hit 20+ HR and 40+ doubles in a season, joining Nomar Garciaparra (1997, 1999-2000, 2002). The Sox went 18-4 in games in which he homered. Is 1 of 6 Red Sox shortstops ever to record 100+ RBI in a season, joining Nomar Garciaparra (1998-99, 2002- 03), John Valentin (1995), Rico Petrocelli (1970), Vern Stephens (1948-50), and Joe Cronin (1937, '39-40). Among ML shortstops, ranked 2nd in OBP, 4th in SLG, 3rd in OPS, 4th in RBI, 6th in HR, and 6th in AVG. Led MLB with 3 grand slams (4/7 vs. TB, 4/30 vs. KC, 7/14 vs. TOR)...Became the 11th Red Sox with 3+ slams in a season, 1 shy of the club record (Babe Ruth, 4 in 1919). Owned MLB's 5th-highest OPS with RISP (1.130), as well as the 10th-highest AVG (.342; 51-for-149). Went 9-for-15 (.600) with 6 XBH with the bases loaded. Hit .269 with a .402 OBP vs. LHP (29-for-108, 1 HR), and .294 with a .901 OPS vs. RHP (119-for-405, 22 HR). In 67 games at Fenway Park, hit .314 with a .967 OPS (80-for-255, 15 HR)...In his first 3 games, went 3-for-4 (2 2B), 2-for-4 (2 2B), and 3-for-4 (HR, 2B)...He is the only Red Sox player ever to record multiple XBH in each of his first 3 games of a season (source: Elias)...The only other major leaguer to do that since 1900 is Adrián González (2015). Started at SS for the Red Sox on Opening Day for the 5th consecutive season (2014-18)...Is 1 of only 7 players to start 5+ straight O.D. games at SS for the Sox. Hit a grand slam and recorded 6 RBI on 4/7 vs. TB, the most in a game by a Red Sox shortstop since Nomar Garciaparra had 8 RBI on 7/23/02 vs. TB. Placed on the 10-day disabled list with a left ankle injury on 4/9...Reinstated on 4/27, missing 15 games. Hit his 2nd grand slam of the season on 4/30 vs. KC, becoming the 1st Red Sox player with multiple grand slams before May 1 since Carl Everett in 2001. Reached base in 21 consecutive games from 5/14-6/6. Named AL Player of the Week for the period 7/2-8, his 1st time ever earning the honor...During a 6-0 week for BOS, went 6-for-15 (.400) with a .600 OBP, 2 HR, 2 2B, 10 RBI, 6 R, 8 BB, 1 HBP, and only 1 SO. Recorded multiple RBI in 4 straight games from 7/3-8, the longest such streak of his career. Homered in 7 of his final 27 games before the break (6/14-7/15), including each of his last 2 (7/14-15). On 7/14 vs. TOR, hit a walk-off grand slam in the 10th inning of a 6-2 win...It was the Sox' 1st walk-off grand slam since Rico Brogna on 8/14/00 vs. TB, their 1st in extra innings since Jim Rice on 7/4/84 vs. OAK. Had 16 HR at the All-Star break, after hitting 10 HR in the entire 2017 season. In his final 41 games of the season (beginning 8/10), hit .327 with a .957 OPS (49-for-150, 7 HR). In 16 games from 8/3-21, drew 12 BB and struck out only 4 times...Recorded a .444 OBP in that time. Homered twice in the Sox' 10-4 win vs. CLE on 8/22. In a 3-game series vs. HOU from 9/7-9, went 8-for-12 with 2 HR and 4 RBI...Was 4-for-4 on 9/9. Recorded 8 RBI in his final 4 games of the season... Homered in 2 of his final 3 games, including in the Sox' 10-2 win vs. NYY in the season finale on 9/30. POSTSEASON: Started each of the Red Sox' 14 postseason games and hit safely in 11 of them, including each of the first 8...Went 13-for-58 (.224) with 7 RBI. Homered in Game 2 of the ALDS vs. NYY. In his 4th full ML season, hit .273 (156-for-571) with a .343 OBP and set career highs in triples (6) and steals (15)...Battled a right hand injury throughout the 2nd half of the season after being hit by a pitch on 7/6 at TB...In 80 games up to that point, was slashing .308/.363/.455 (96-for-312, 20 2B, 4 3B, 6 HR) with 41 RBI. Served as the Sox' leadoff hitter 28 times, including in each of his final 17 appearances...In that role, hit .309 with a .406 OBP (34-for-110, 16 BB, 15 SO). Hit 3 HR on 0-2 counts, tied for the most in MLB. His 6 triples ranked T-3rd in the AL. Was 1 of 5 AL players named to the Esurance MLB All-Star Game Final Vote ballot. In his first 31 games through 5/12, batted .350 (42-for-120) with a .405 OBP. Recorded a 15-game hitting streak from 4/27-5/12 (23-for-59, .390), the longest by a Red Sox all season. Hit 2 triples on 5/17 at STL, becoming the 1st Red Sox SS in 70 years with multiple triples in a game (last: Johnny Pesky on 7/20/47-G2 at STL). Did not homer in his first 41 games of the season through 5/24, then hit 6 HR in 38 games from 5/25-7/5. Recorded his 1st career multi-HR game on 6/18 at HOU. On 6/30 at TOR, entered as a defensive replacement in the 10th inning and broke a 4-4 tie with a game-winning RBI single in the 11th. Hit on the right hand by a Jacob Faria pitch in the 1st inning on 7/6 at TB...Removed after the half inning. Went 7-for-55 (.127) in his next 14 games from 7/8-28. Scored at least 1 run in 9 of 10 games from 8/15-25. In his final 20 games (beginning 9/9), scored 21 runs and hit .321 with a .430 OBP (25-for-78, 2 HR, 13 BB, 12 SO, 2 HBP)...Hit safely in his final 9 games of the season. Reached base 6 times in the Sox' 13-7, 15-inning win at TB on 9/15 (4-for-7, HBP, BB). POSTSEASON: Started at SS in all 4 ALDS games vs. HOU...Went 1-for-3 with a HR and 2 R in Game 4. Earned his 1st All-Star selection and his 2nd consecutive Silver Slugger Award...Recorded career highs in games (157), runs (115), HR (21), RBI (89), BB (58), SB (13), OBP (.356), and SLG (.446). Won the Boston BBWAA's Jackie Jensen Hustle Award, presented to a Red Sox player for spirit and determination. Became the 1st player in Red Sox history to earn multiple Louisville Slugger Silver Slugger Awards at SS, and only the 6th to win the award multiple times at any position...Was the 1st Red Sox INF to win a Silver Slugger in consecutive seasons since Wade Boggs from 1986-89, and the 1st AL SS to do so since Derek Jeter from 2006-09. Named to 3rd career Opening Day roster at only 23 years old...Also made Opening Day starts at SS for BOS in 2014 (21) and 2015 (22)...Became the 8th Red Sox in the last 100 years to make as many as 3 Opening Day starts at age 23 or younger, and 4 of them are in the HOF (Bobby Doerr, Babe Ruth, Ted Williams, Carl Yastrzemski). Ranked T-7th in the majors with 192 hits...Led the AL with 81 hits in 2-strike counts. Hit 21 HR, more than he had in his first 3 ML seasons combined (20)...His 13 SB matched his total from 2013-15. Became the 1st player in Red Sox history to homer 20 times in a season as a SS before turning 24 (source: Elias). Ranked 8th in the majors with 115 runs scored...Scored 31 more runs and drew 26 more walks than he did in 2015, despite playing in only 1 more game (157 in 2016, 156 in 2015). Led AL SS in hits and runs and ranked 2nd in doubles (34) and RBI. Hit safely in 26 straight games from 5/6-6/2, tied for the 2nd-longest streak ever by a Sox SS...During the streak, was 45-for-117 (.385) with a .419 OBP and a .581 SLG (8 2B, 5 HR, 23 R, 20 RBI, 7 BB). Posted a .323/.394/.495 line at home (103-for-319, 20 2B, 3B, 11 HR). Among players with 100+ AB in May, ranked 1st in the AL in AVG (.395), 2nd in OBP (.429), and 5th in OPS (1.017)...Scored in 8 consecutive games from 5/21-29, the longest such streak of his career. Recorded multiple hits in 6 straight games from 5/9-14 (14-for-30, .467 AVG), tied for the longest streak by any major leaguer in 2016. Broke a 3-3 tie with a 2-run single in the 10th inning of the Sox' 5-3 win at SF on 6/7. From 6/10-11 at MIN, became the 1st Red Sox ever with 4+ hits and a HR in consecutive games (source: Elias)... Was only the 3rd SS ever with 4+ hits and 3+ RBI in consecutive games (also CLE's Lou Boudreau, 1948; and TEX's Alex Rodriguez, 2003)...Became the 2nd Red Sox SS in 100 years with 4+ hits in consecutive games (also Johnny Pesky, 5/4-6/46). Recorded his 100th hit of the season on 6/19 vs. SEA...Became the 1st major leaguer with at least 100 hits through 68 team games since Ichiro Suzuki (103) and Matt Holliday (100) in 2007. Recorded his 4th career walk-off hit on 6/23 vs. CWS...At 23 years old, joined Bobby Doerr as the only players in Sox history with as many as 4 walk-off hits before turning 24 (Doerr had 4; source: Elias). Selected to start the 87th MLB All-Star Game at SS via the fan ballot on 7/11 at Petco Park (1-for-2, 2B)...Joined Mookie Betts as the 3rd pair of teammates-each age 23 or younger-to start the All-Star Game (source: Elias)...The others to do that were Ted Williams (LF) and Bobby Doerr (2B) of the 1941 Red Sox, and the Angels' Jim Fregosi (SS) and Dean Chance (P) in 1964. Hit .393 (22-for-56, 3 HR) with a 1.040 OPS during a 13-game hitting streak from 7/19-31. Committed only 1 error in 167 chances (.994) in his final 49 games (beginning 8/10). Turned 24 years old on 10/1...The only Red Sox to record more hits than Bogaerts' 524 before turning 24 are Ted Williams (714), Bobby Doerr (661), and Tris Speaker (547)...The only Red Sox to record more RBI than Bogaerts' 221 before turning 24 are Williams (491), Doerr (363), Tony Conigliaro (294), and Carl Yastrzemski (235). POSTSEASON: Started each of the Red Sox' 3 ALDS games at SS. Finished 2nd in the AL with both a .320 AVG (5th in MLB) and 196 hits (3rd in MLB) and won the AL Silver Slugger Award at SS. After the season, named the SS on The Sporting News' AL All-Star Team...Also named team MVP by the Boston Chapter of the BBWAA, the first Red Sox SS to be recognized since Nomar Garciaparra in 1998. Was the youngest Red Sox player to earn a Silver Slugger Award at any position (turned 23 in October) and the youngest AL SS since Alex Rodriguez with SEA in 1998. Led the Red Sox with 156 games, 613 AB, and 231 times on base... Played all 156 games at SS, with 154 starts...Marked 2nd-most games at SS in MLB to TEX's Elvis Andrus (160)...Had the most games and starts at SS by a Red Sox since 2003 (Nomar Garciaparra, 156 games and 155 starts). Topped ML shortstops in AVG, hits, runs (84), doubles (35), total bases (258), and OBP (.355)...Recorded 35 more hits than any other SS... Also topped AL shortstops (2nd among ML SS) with 81 RBI. His 196 hits ranked 3rd in the majors behind only MIA's Dee Gordon (205) and HOU's Jose Altuve (200)... It was the most ever hits by a Red Sox in an age-22 season or younger, passing Ted Williams in 1940 (193). His .320 AVG trailed only Miguel Cabrera (.338) in the AL...Marked an 80-point improvement over 2014 (.240). Led MLB with a .340 AVG (154-for-453) in his last 109 games beginning 5/31, totaling 14 more hits than any other player in that stretch. Had the 2nd-best fielding percentage among AL shortstops (.984) behind BAL's J.J. Hardy (.993)...Named a finalist for the AL Rawlings Gold Glove Award at SS. Ranked T-4th in MLB with 57 multi-hit games and T-3rd in the AL with 17 games with at least 3 hits...Tied DET's Ian Kinsler for the ML lead in 4+ hit games (6). His 6 games with 4+ hits marked the most by a Red Sox since Dustin Pedroia in 2008 (7)...All 6 came as a 22-year-old, most in the majors that young since KC's George Brett had 6 in 1975, and most by a Red Sox prior to turning 23 since at least 1914. Placed 2nd in the majors with a .365 AVG vs. LHP (57-for-156), including an ML-best .419 (36-for-86) against lefties from 7/2 through the end of the season...Hit .304 (139-for-457) against RHP, 7th best in the AL. Had MLB's 2nd-best home AVG (.347), trailing only Miguel Cabrera (.357)...Also ranked among AL leaders in day AVG (4th, .335) and night AVG (6th, .312). Was 9th in the AL in AVG with RISP (.331, 53-for-160) and was 5th in AVG with 2 out and RISP (.386, 27-for-70). Led the majors with 10 hits, 6 XBH, and 26 RBI in 27 PA with the bases loaded (.385, 10-for-26, 4 2B, 3B, HR, SF). Hit 1st career grand slam and drove in a career-high 5 runs in the 8th inning on 9/21 vs. TB, turning a 4-6 deficit into an 8-6 lead. Led the majors with 9 hits in extra innings, the most in a season by a Red Sox since at least 1974...Overall, batted .692 (9-for-13), 2B, HR, 3 RBI, 3 BB in 17 PA in extra innings. Hit .312 in June, .371 in July, .324 in August, and .357 in September...Was the 1st player age 22 or younger in the last 35 years to hit at least .310 in 4 consecutive months of one year (min. 100 AB in each month). Batted an ML-best .341 (116-for-340) in 80 games as the No. 3 hitter in the lineup (min. 150 PA)...Each of his last 87 starts beginning 6/25 came in the 2nd or 3rd spot in the lineup...Hit no higher than 7th in his first 32 starts. Tied David Ortiz for the team lead in game-winning RBI with 12...Delivered 2 of the team's 3 walk-off hits, both singles, on 4/17 vs. BAL (9th inning) and 7/24 vs. DET (11th inning). Went 4-for-8, R, BB, SB in the Red Sox' 19-inning win on 4/10 at NYY...Was the 1st Red Sox to record as many as 4 hits during the extra innings of a game since at least 1947. Hit 1st HR of the season on 4/25 at BAL in the 10th inning, his 1st career extra-inning HR. Hit a game-winning, 3-run single in the 7th inning on 7/7 vs. MIA, the first 3-run single by a Red Sox in the regular season since Gary Allenson vs. DET on 9/11/82. Had a career-best 23-game on-base streak from 8/30-9/25 (.385/.433/.552, 37-for-96, 8 BB), longest by a Red Sox SS since Nomar Garciaparra reached in 26 consecutive games from 4/27-5/26/03...Included a career-high 12-game hit streak from 9/9-23 (.396, 21-for-53). Played a team-high 144 games in his 1st full major league season at age 21...Saw time between SS (99 games, 98 starts) and 3B (44 games, all starts)...Ranked 2nd on the team with 41 extra-base hits (David Ortiz, 62), tied for 3rd among AL rookies...Also placed among AL rookie leaders in hits (3rd, 129), total bases (3rd, 195), 2B (3rd, 28), BB (T-3rd 39), multi-hit games (4th, 35), runs (4th, 60), HR (5th, 12), and RBI (5th, 46)...Hit a team-best .308 (37-for-120) when leading off an inning, 11th in the AL (min. 75 PA)...Averaged 4.1 pitches seen per PA, 11th best among AL qualifiers, the highest by a ML rookie since ATL's Jason Heyward in 2010 (4.1)...Served as Boston's everyday SS through 6/1...Shifted to 3B on 6/2 when Stephen Drew was recalled...Returned to SS following Drew's 7/31 trade to the Yankees...Hit .266/.333/.391 as a SS compared to .182/.217/.300 as a 3B...Was batting .299 (66-for-221) with 17 2B, 3B, 5 HR, 17 RBI, and 25 BB in 59 games through 6/7...In his next 60 games from 6/8-8/30, hit just .143 (31-for-217) with 5 2B, 3 HR, and 13 RBI...Ended the season with a .320 AVG (32-for- 100) in his last 25 games from 8/31 on...On 3/31 at BAL, became Boston's youngest Opening Day SS in a century (21-year-old Everett Scott in 1914)...Ranked 2nd on the team with 41 times on base through the end of April, 2nd most in team history by a rookie before the month of May (Nomar Garciaparra, 45 in 1997)...Had a career-high 16-game on-base streak from 4/16-5/4 (.298 AVG, 17-for-57, 5 2B, HR, 5 RBI, 10 BB, .429 OBP)...Began that stretch with a career-best 10-game hit streak (.324 AVG, 12-for-37, 4 R, 4 2B, HR, 5 RBI)...Worked a 14-pitch PA in the 5th inning on 5/15 at MIN (flyout to CF). Hit 1st career HR at Fenway Park on 5/17 vs. DET...Was the youngest Red Sox to go deep at Fenway Park since Jim Rice in 1974 at 21 years old...According to Elias, became the youngest Red Sox ever to string together 3 straight 3+ hitgames from 5/28-30...His 89 times on base through the end of May were the most ever by a Red Sox rookie and most by an AL rookie since SEA's Ichiro Suzuki reached 97 times before June in 2001...Homered in consecutive games for the 1st time in his career 6/2-6/3 at CLE...Did it again 9/9-9/10 vs. BAL...Drove in both Red Sox runs in a 2-1 win on 8/6 at STL...Sac fly in the top of the 9th inning was his 1st career game-winning RBI...Removed from the game on 8/22 vs. SEA after being struck in the head by a pitch by Felix Hernandez...Placed on the 7-day concussion DL on 8/25 (retro to 8/23) and activated on 8/30...From 8/31 through the end of the regular season, ranked among AL leaders in AVG (10th, .310) and SLG (10th, .500)...Placed 2nd on the team with 4 HR, 10 XBH, and 16 RBI. Played in 18 regular season and 12 postseason games for the Red Sox in his ML debut. Selected to BOS' active roster on 8/19 and made 12 regular season starts between SS (8 G/6 GS) and 3B (9 G/6 GS)...Hit safely in 7 games and the Sox were 7-0 in those contests. In the regular season with BOS, went 7-for-15 (.467) vs. LHP and 4-for-29 (.138) vs. RHP. Made ML debut with a start at SS on 8/20 at SF (0-for-3)...At 20 years and 323 days old, was BOS' youngest position player to appear in a game since Dwight Evans in 1972 (debuted at 20 years, 318 days old on 9/16 that year)...Was the Sox' youngest SS since Luis Alvarado in 1969 (20 years old) and the club's youngest player to appear in a game overall since RHP Jeff Suppan in 1995 (20 years old). Was 3rd-youngest player to appear in a ML game in 2013 behind WSH's Bryce Harper and TEX's Jurickson Profar. Singled off Brandon League in the 9th inning on 8/24 at LAD for 1st ML hit. Recorded 1st extra-base hits of ML career 9/7 at NYY, including 1st home run off Jim Miller in the 5th inning. Split minor league season between Double-A Portland and Triple-A Pawtucket, combining to hit .297 (132-for- 444) with 23 doubles, 6 triples, 15 homers, 67 RBI, and 63 walks in 116 games. Named USA Today Sports' Minor League Player of the Year and tabbed the SS on Baseball America's Minor League All-Star First Team…Received Greg Montalbano Award as Red Sox Minor League Player of the Year by the Boston Baseball Writers...Also named Baseball America's Red Sox Minor League Player of the Year. Rated by Baseball America as the No. 1 prospect in both the International League and the Eastern League… Named the top Eastern League batting prospect in Baseball America's Best Tools Survey. At Double-A Portland and Triple-A Pawtucket, combined to hit .297 (132-for-444) with 23 doubles, 6 triples, 15 home runs, 67 RBI, 63 walks, and 7 stolen bases. Began season with 56 games for Portland, batting .311 (68-for-259) with 12 doubles, 6 triples, 6 HR, and 35 RBI... Hit in 14 of his last 15 games at Double-A from 5/27-6/12 (.440 AVG, 22-for-50, 4 2B, 3B, 4 HR, 14 RBI). Played 60 games with the PawSox after a 6/13 promotion and hit .284 (32-for-225) with 11 doubles, 9 homers, and 32 RBI...With Pawtucket, made 49 appearances at SS and 10 at 3B. At 20 years old, was the youngest player in the International League all season. Made PawSox debut in a 6/14 doubleheader vs. Buffalo...Scored walk-off run in the 7th inning of Game 1, and launched a 2-run homer in Game 2. For 2nd straight year, participated in the XM All-Star Futures Game...Started at SS for Team World in the 7/14 exhibition at Citi Field in New York...Went 2-for-3 with a walk and a run scored. Invited to 1st Major League Spring Training and was the youngest Red Sox in big league camp (20 years old). Appeared in 7 World Baseball Classic games during Netherlands' run to the World Championship Round…Went 5-for-19 (.263) with 2 doubles, an RBI. Following the season, ranked as Boston's No. 1 prospect and the best power hitter in the system for a 2nd straight season, according to Baseball America. Honored as Red Sox Minor League Offensive Player of the Year and Baseball America'sRed Sox Minor League Player of the Year after splitting the season between High-A Salem andDouble-A Portland...Also named to Baseball America's Minor league All-Star Second Team.Combined to hit .307 (146-for-476) with 37 doubles, 3 triples, 20 home runs, 81 RBI, and 44 walks in 127 games...Ranked among Red Sox minor league leaders in home runs (T-2nd), RBI (3rd), and AVG (T-4th).Was the Eastern League's youngest position player all year (2nd youngest overall).Began year with 104 games for Salem and was named a Carolina League Regular and Post-Season All Star.Placed among Carolina League qualifiers in AVG (4th, .302), OBP (4th, .378), and SLG (2nd, .505).Tied for the Carolina League lead with 8 homers over a 25-game stretch from 6/3-6/28...In that time, led the circuit in SLG (.679) and OPS (1.144)...In 30 June games, batted .337 (34-for-101) with 24 RBI.Promoted to Portland on 8/9 and homered that night in Double-A debut at Akron...Hit safely in his 1st 6 games at that level, including multiple hits in his 1st 4 tilts with the Sea Dogs. Played for the World Team in the All-Star Futures Game on 7/8 in KC...Started as the DH and went 1-for-4.Named CL Batter of the Week for 7/30-8/5, his last full week in the circuit...In that stretch, went 13-for-24(.541) with 6 doubles, 4 RBI, and 4 walks.Hit safely in 19 of 23 games with Portland at .326 (30-for-92), including 10 multi-hit contests.Following the season, ranked byBaseball America as BOS's No. 1 prospect, as well as the best power hitter andbest athlete in the system...Also selected as No. 1 position player prospect (No. 2 overall) in the Carolina League. Jumped to Single-A Greenville for his 1st season in the U.S.Reported to the Drive on 6/9 and spent the rest of the season as the club's youngest player.Ranked 3rd on the team with 16 home runs, tying for 3rd most in the South Atlantic League during his time with the club.Knocked 2 home runs at Rome on 7/10, his 1st career multi-homer game.Named the SAL Batter of the Week for 7/25-31 after going 8-for-23 (.348) and tying for the league lead with3 homers and 7 RBI.Closed out the season batting .352 (25-for-71) in his last 19 games, including 9 multi-hit efforts.Following the season, rated as BOS's No. 2 prospect and the No. 10 prospect in the SAL by Baseball America...Also tabbed the No. 58 prospect in all of baseball. Named Red Sox Latin Program Player of the Year and a Dominican Summer LeagueAll-Star in his 1st professional season.Led the DSL Red Sox in AVG (.314), hits (75), HR (3), RBI (42), total bases (101), SLG (.423), and OPS (.819).Ranked 8th in AVG among DSL hitters with at least 200 AB.Topped the circuit with 295 chances and 110 putouts at shortstop.He and twin brother Jair each hit a grand slam on 8/20 in a 16-0 win at the DSL Indians.Tied for the 2nd-longest hit streak of the year in the DSL with a 13-game run to close out the season, over which he batted .358 (19-for-53) with 2 homers. April 27, 2018 Boston Red Sox activated SS Xander Bogaerts from the 10-day injured list. April 24, 2018 Boston Red Sox sent SS Xander Bogaerts on a rehab assignment to Pawtucket Red Sox. April 9, 2018 Boston Red Sox placed SS Xander Bogaerts on the 10-day disabled list. Small crack in talus bone in left ankle. April 11, 2017 Boston Red Sox activated SS Xander Bogaerts from the bereavement list. April 7, 2017 Boston Red Sox placed SS Xander Bogaerts on the bereavement list. August 30, 2014 Boston Red Sox activated SS Xander Bogaerts from the 7-day disabled list. August 19, 2013 Boston Red Sox selected the contract of SS Xander Bogaerts from Pawtucket Red Sox. July 18, 2013 Xander Bogaerts roster status changed by Pawtucket Red Sox. July 13, 2013 Pawtucket Red Sox placed SS Xander Bogaerts on the temporarily inactive list. June 13, 2013 SS Xander Bogaerts assigned to Pawtucket Red Sox from Portland Sea Dogs. April 10, 2013 SS Xander Bogaerts assigned to Pawtucket Red Sox. February 9, 2013 Boston Red Sox invited non-roster SS Xander Bogaerts to spring training. August 9, 2012 Xander Bogaerts assigned to Portland Sea Dogs from Salem Red Sox. April 4, 2012 Xander Bogaerts assigned to Salem Red Sox from Greenville Drive. May 28, 2010 DSL Red Sox signed Xander Bogaerts.